Release Date - early 1995 (January) in the US. What caused me to blow off the dust? - Found myself singing the guitar part of "Love Spreads" and decided it was time to give this record another spin. Overview - This album came out a full five years after their landmark debut album. After some legal tie ups this album saw the light of day in the fall of 1994 in the UK and early 95 in the US. There was a lot of pressure since the bands first was seen as such a ground breaking release. It made dozens of best of list that year as well as still finding its way on to some of the "greatest albums ever made" lists. Out of the gate the critics were somewhat "blah" on the record but over time the voices of the fans seemed to ring true, this was on par with the debut, and it some eyes, better than the first. Sadly this was it as far as studio albums. The band gets a funny mention in the film Shaun of the Dead in which the characters toss albums at the zombies but Shaun can't bring himself to toss this record at them...he apologizes for his liking of the record as well. FDF Comments (aka the songs) - The almost "too long for its own good" track "Breaking Into Heaven" begins the album. It clocks in at over 11 minutes and the first part is water running, birds chirping, you name it. Once its gets going its a wonderfully "broad" song. The drums are simple yet punctuated. The bass line swoops in and holds down a steady groove. The guitar can solo here and there and not be "overdone". Once into the track its easy to see why the band went with this as the lead off. Not only is the payoff for hanging on well worth it you are dying for more as the track fades. "Driving South" has more a heavier overall sound. Squire lays down a great lead and the drums, although in a simple four four time hammer the tune along. A slight effect on Ian's vocals add a subtle faintness. By the second track you can see where egos could clash. For a band that seems so "basic" the musicians are flawless. This is the first of "many" tracks in which Squire shines. Each brings a strong influence but each holds their place. "Ten Storey Love Song" was a single released to US radio. Although a catchy song its not "faster" or "slower" than any other track. At the time it was probably one of the easier Stone Roses songs for radio stations to add to their play list and still sound hip. Its not very long and has that great "Manchester" sound so many stations loved to talk about at the time. "Daybreak" fades right up out of love song. Mani holds the court on the intro as his bass playing swoops in. The bass is not flashy but "right there" and Reni feeds off the groove. The track ends on some great guitar work by Squire. In under three minutes "Your Star Will Shine" comes and goes. This is the prefect part of the record for an acoustic interlude. "Straight To the Man" begins with some light congas drums and has a light feel to it. "Begging You" is a great great track. Its got a little more a fast techno drum beat and the guitars are put on a cool loop delay. One of the standouts on the record for sure. "Tightrope" is a far more mellow affair than Begging you. Again more "ooh-ahh" vocals and light percussion work. Squire takes to the acoustic guitar once more on the track. It translates okay to an "acoustic" portion of a live show. "Good Times" follows and Squire is just amazing on this track. Its a full guitar lead while Mani provides a great swooping bass line. The last 1:30 of the track Squire just goes off. Its not this super flashy solo but its one of the better ones you'll lay your ears on. "Tears" begins with acoustic guitar and harmonica. Ian unloads the trademark howl on this particular track and about half way into the song the band just opens up. The drums come crashing in and the band settles in to a strong groove. "How Do You Sleep" keeps with the sound we have grown to either love or dislike about the Stone Roses. "Love Spreads" will lead you to believe this is the end of the record (we will get to that in a moment). Released as a single from the album in the US Squires guitar work is right at the front once again. The radio edit strips some of the guitar work but once more Squire shines. This might be the only Stone Roses songs causal fans might be able to pinpoint as hearing before. It sums up their overall sound perfectly and would wrap the record up on a tight note. The band is nice enough to include a hidden track but it is buried (depending on your player etc) at about track 90. There are dozens of tracks that clock in at 4 seconds. Buried is the song often referred to as "The Foz". Some might say there is a reason it was hidden. It sounds like an out of tune jam honestly. You are missing zero on this one. Then we wrap it up w/more silent tracks. If you ever load this on your iTunes be sure to do some major "unchecking" before making the move. Where are they now? - Reni left the band in March of 1995 and went on to form a band called "The Rub". Rumor has it now that he is working on a solo album. John Squire left the band in April of 1996. He went on to form the Seahorses who released just one album before breaking up. He has since release two solo albums. Mani joined Primal Scream in 1998. Ian Brown has released a four solo albums and has toured for each released. US audiences don't seem to care much for his solo efforts. FDF Personal Comments (aka the Live experience) - The Stone Roses were a massive live band overseas but they were once quoted when asked "why haven't you toured the US yet" the response was "America is Not ready for us". Also they were asked to open for the Rolling Stones, to which they responded "They can open for us!". That being said the one and only tour the Stone Roses did of the US landed in Boston on May 21, 1995. I recall snatching up 6 or more tickets and when the night of the show came I went with my older brother (who wanted to go mind you) but all the other guys that wanted to go decided to go get drunk that weekend. It was a loud and smoke filled show...but..the band was off. There is a bootleg around from this very show (its this weeks special down load) but read the comments about it here. Funny thing is they graded it an "A" sound..but that is pushing it as well. FDF Overall Takee - The UK Press felt let down on this album but some feel this is better than the debut. What is amazing is that when you really look at it, this band released just two studio albums that were pretty great. In this day and age with bands re-forming some can only hope to see the band have a go at it once more. Either the debut or this release you'd not be ashamed to have in your collection, and frankly you should have one of them. Second coming is forgotten no more..well for now. Begging You Taken from "Second Coming"
Good Times Taken from "Second Coming". The guitar work on this tune rules. *note I did not tape this show. Putting up clips makes this blog 1,000% better. Putting up live shows makes this blog 1,000,000% better. Nicely done mate. I started to read this entry, and then being short on time I went to take a shower. 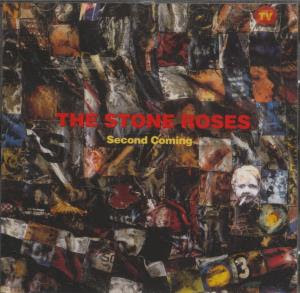 While in the shower I was listening to the radio and oddly enough they played a Stone Roses track. It was off the debut album, but it was still the first time in months I've heard the Stone Roses on the radio. I've often thought this band is the band that should have defined 90s music, not Nirvana. It's a shame that we were never "ready" for them. I can only imagine how much better rock radio would be now, if today's musicians grew up listening to the Stone Roses and not Nirvana. Thanks for this- it's nice to have a 'reason' to get back into Second Coming. I am a big Stone Roses fan. Thank You sir.